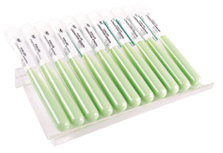 Löwenstein-Jensen medium containing glycerol is used for human Mycobacterium tuberculosis culture in laboratory conditions as well as detecting of Mycobacterium tuberculosis presence in specimen extracted from patient. Medium provided as a green-coloured slant. Obtained from egg yolk mass combined with aqueous salt solution and glycerol, as well as aqueous malachite green solution acting as bacteriostatic agent for other microorganisms. Medium is produced in hermetic test tubes, which prevents drying and provides constant growth conditions during examination.